Q: The University of South Alabama’s campus is prettier every time I drive by. Who is the driving force behind this beautification? A: Gary Carley, USA’s manager of landscaping and grounds operations, shares the story of his experience at USA and his hopes for its landscaping future. 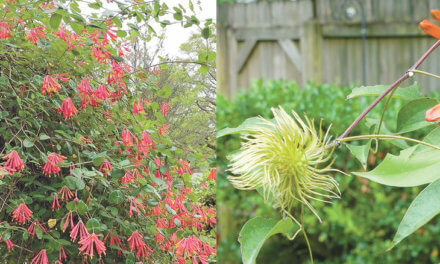 Carley has a long history in landscaping, having begun as a student at Spring Hill College in the 1970s. He owned a landscaping business for 24 years and a wholesale nursery for 16. Before transferring to USA’s main campus in 2009, Carley spent eight years with the grounds department at USA Hospitals, during which he helped to develop the Geri Moulton Children’s Park. He and his 55 dedicated and hardworking staff members have spent the past seven years implementing a plan initiated by then-President Moulton to give USA the beautiful campus you see today. Carley does all of the landscape design. He explains, “I see what’s here and what should be here; my brain is a camera.” He spoke of inheriting this gift and his work ethic from his dad. His goal is to create a better environment for students, faculty and staff, as well as for prospective students and parents. He also wants the community to enjoy the campus — walk the grounds, ride bikes and use the trails, as many already do. (Photos | University of South Alabama) The landscaping at the intersection of Old Shell Road and University Boulevard is a result of a joint venture between USA and the city of Mobile, initiated by President Tony Waldrop, Dr. John Smith and Gina Gregory representing the Mobile City Council. When asked the secrets of his success, Carley began with one basic that he learned during the cleanup following Hurricane Frederic in 1979: Stick with what works. When seasons change, workers keep some replaced plants for campus projects and hold others in irrigated areas for repurposing. 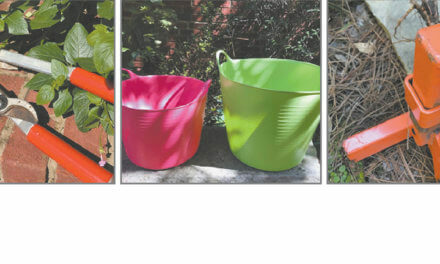 They buy plants and supplies as needed from local wholesale nurseries and suppliers. Carley has learned it is best to put plants directly into the natural soil, allowing them to become established before fertilizing. After they are established, they fertilize annuals with a 20-20-20 liquid monthly; for shrubs and perennials, they use a time-release fertilizer twice in a growing season. The many trees on campus create a challenge, so for shady areas they use autumn ferns, holly ferns, Endless Summer® hydrangeas, Shi-Shi Gashira sasanquas, native azaleas and plum yews. For sunny areas in spring and summer, they use Limelight hydrangeas, African irises, Drift® roses, buddleia, Sunpatiens®, vitex (which has long, purple spiked plumes) and Profusion zinnias. Some fall and winter plants are autumn ferns, Shi-Shi Gashira sasanquas, cyclamens, ornamental cabbages, muhly grass, purple fountain grass, dusty millers, pansies and petunias. One of Carley’s favorite projects is an area they call “Fern Gully,” where then-President Moulton incorporated a bronze statue of Santiago de Chile. They used boulders, ferns, native azaleas and hydrangeas to create an inviting picnic area in this shady ravine on the north side of campus by the University Center. 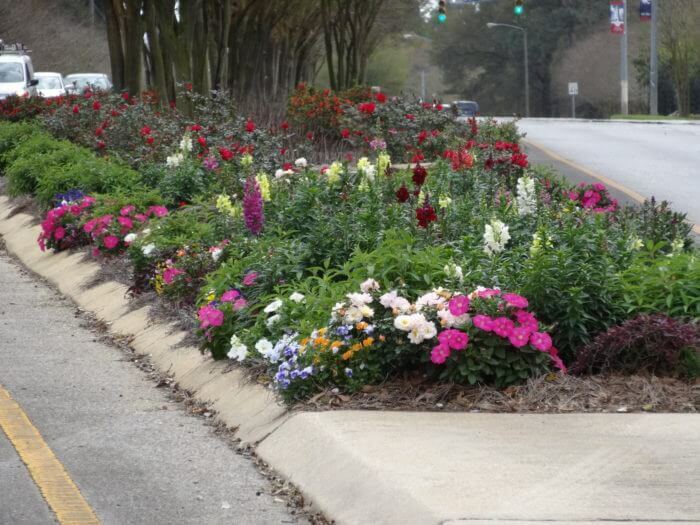 The landscaping at the intersection of Old Shell Road and University Boulevard is a result of a joint venture between USA and the city of Mobile, initiated by President Tony Waldrop, Dr. John Smith and Gina Gregory representing the Mobile City Council. Another is at the entrance to Municipal Park at Gaillard Drive and University Boulevard. Now they are working on the city’s medians bordering the USA campus. President Waldrop and his administration are conscientious about presenting USA’s campus and its surroundings in the most positive way. And Gary Carley hopes to continue developing the university’s curb appeal as it becomes an even greater asset to the community. When: Monday, March 20, noon to 1 p.m.